Our profile this morning is with Network Automation, a Los Angeles company competing in the IT automation market. Southern California--despite the lack of huge, name brand firms-- has a significant number of enterprise software companies, of which Network Automation is just one. We spoke with Gary Bishop, the firm's CEO, to learn more about the company. Gary Bishop: One of the things about Los Angeles which I think is very unique, is it's been great for entrepreneurialism. There have been a lot of entrepreneurs here in software and other industries, and interestingly enough there seem to be more self-funded, bootstrapped firms here, rather than those looking for venture capital to get off the group. I think people are often confused, because although there are very few, large scale Fortune 1000 companies, there is an enormous economy here fueled by entrepreneurial activity. You are self funded too, we recall. Could you explain to our readers what about what Network Automation does? Gary Bishop: Yes, we're a self funded company, which was founded in 2004. What we do is provide an automation solution to the market at large. Our clients range from everything from SMBs, managed at the micro level, to businesses all the way to the Fortune 1000. About 30 to 45 percent of our business is international. Our marquis customers are companies like Citibank and Lowe's Corporation, along with many others. We have a very unique capability in scalability, but at an agreeable price point. The automation we provide is unique. We are handling IT processes which are normally the purview of large players like BMC and CA Technology, HP, and IBM--considered the Big 4 in IT administration. We also cross into the GUI level of automation, so that a customer can interact with an application and websites as if there was someone at a keyboard. The best way to think about us, is we automate software, doing lots of the manual tasks you'd normally have to do with software, and allow users to drag and drop to put together processing flows and tasks. Can you give a concrete example of how that might work? Gary Bishop: My background, prior to Network Automation, was in the financial technology marketplace. I spent eleven years at Sungard, delivering capital markets and treasury management solutions to the largest banks and Fortune 1000 companies across the world. One of our main themes, was straight-through-processing. Ultimately, what that means is customers want to enter their data once, and have that carry through clearing, to back office settlement, to system reporting, to confirmation delivery, to trading partners you are involved with, and all of that. Without automation, you are going to be rekeying that two, three, four, or five times. Obviously, there's a downside to that, because it's expensive to have people entering data, and that runs the risk of errors in input. The traditional way to handle that is to write code. However, as you can se eour our website, our motto is no code, no limits. There is a worldwide shortage of programmers, and you usually want the programmers you have involved in the high value things, such as trading systems. Integration with disparate systems and automating things from Point A to Point B is very difficult to do, assigning programmers is difficult, particularly since other things have a much higher level of ROI. Our automation allows IT professionals, who may not be programmers, to create straight through processing and workflow to tie things together. Though straight through processing is a trading problem, it can also be adapted to an ERP system, or order entry, or virtually any interaction with an application or web site. We can even automate interaction with a search engine, for example, if you might have 5,000 search strings you need to put into a search engine. You can create a script to download that in a matter of minutes, and let your computer do it in the background all day long. We can take all those search results, put them into a spreadsheet, and automatically email it to interested parties. How did the company come about, what was the issue you were trying to solve? 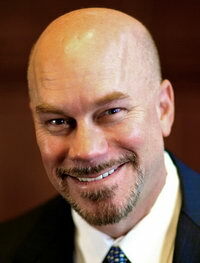 Gary Bishop: The founder of the company is Dustin Snell, who is a classic, bootstrap entrepreneur. He spent a number of years with another, Southern California bootstrap, Goldmine. As you probably know, Goldmine used to compete with ACT, and was a precursor to software like Salesforce.com when contact management software started on laptops. It was started here in Pacific Palisades, at the end of Sunset and the PCH. Ironically, I used to pass their offices every day commuting from the Palisades to Calabasas, where I was running Sungard Treasury Systems. Dustin got his orientation from the founders of Goldmine, and saw that there was lots of value in the fact that Goldmine needed to be integrated with products like Excel, Outlook, and other software. From that, he formulated the idea behind automation, and AutoMate, and founded the company using those lessons he learned. Since then, we've had a very strong growth record. We recently announced we had above 25 percent growth in our last fiscal year, which as a self funded company is a pretty phenomenal result. The technology has just exploded. In 2004, there was just rudimentary usage of web sites, and now, we've got cloud based, software-as-a-service. It's a much more, complex integration problem with regard to the straight-through processing we're talking about. It's a much more complex picture, with on-premise processing assets, the cloud, SaaS based processing, and more trading data from FTP, AS2, and other mechanisms. What makes us unique, is we've got an automation platform which allows you to deploy in any of those ways. You mentioned the big players in this market. How do you compete against them? Gary Bishop: I don't think we necessarily consider the big 4 competitors, because they operate on a completely different level. The recent announcement by HP really echoes what they are trying to do. They are looking for very large engagements, and there is a huge investment in infrastructure for the products that companies like HP and IBM deliver. They might provide great value, but not every project requires that level of investment, or can even sustain that level of investment. We do a lot of business with small companies, who cannot reach that level of investment that you need with an HP or CA. We can deliver a very functional, automation platform for less than $2000. If you want to buy something for less than $2000 from IBM, that's a very difficult thing to do. So, when IT professionals have an issue which they need to solve, and can only invest on a low level, we can provide them ROI on an incremental basis, and they can continue to scale with us. The other thing, is because we don't have an army of salespeople like IBM or HP has, people have to find us. We use all of the technology out there, including social networking, LinkedIn--where recommendations from our customers are very strong--and we have a community based capability, where our users can talk via forums. We have a very strong fan base. Finally, has it been difficult competing in the market as a self funded company? Gary Bishop: We've been able to make big use of available technology, plus about 30 to 45 percent of our sales are international. That's been because of our ability to do two things. One, is we've been able to attract partners who are very capable in those markets. We've got tremendous partners in Italy, the Netherlands, Sweden, South Africa, Australia, Brazil, and many other regions, who really know their market, and know that our technology solution will do well there. We also have many customers who find us through search engine activity and social network activity. They might be looking for FTP automation or automate, and you'll see us come up. We're making use of our technology to reach out all over the globe, and to inform people about our unique value proposition. If you look back fifteen years ago, a company this size would be hard pressed to put together a partner network together, but available technology allowed us to do that, so that we now have 120 partners around the globe.